The thing we have to establish to be able to talk about this with the same frame of reference is that Dez Bryant didn't catch that football. Oh sure, maybe he had the ball firmly in his grasp, maybe he was confident enough in his possession to turn and lunge for the end zone, wheeling his feet under him the entire time. But that's merely a "catch" in the sense that all English-speakers would use the term. This is football. Well, here's the play. Did Bryant do all those things quoted above? It doesn't matter, because rule 8.1.3 has more to say. The NFL rulebook always seems to have more to say. Item 1: Player Going to the Ground. If a player goes to the ground in the act of catching a pass (with or without contact by an opponent), he must maintain control of the ball throughout the process of contacting the ground, whether in the field of play or the end zone. If he loses control of the ball, and the ball touches the ground before he regains control, the pass is incomplete. If he regains control prior to the ball touching the ground, the pass is complete. After reading that, you can't, with much intellectual honesty, claim that it was a bad call. Cowboys fans might try to debate the intentions behind specific words—"throughout," "process," and "control" could be fruitful ground—as might anyone with a sense that a cosmic or common-sense injustice was perpetrated, but that's the wrong tack. It was the correct call. It is a bad rule. Football is a poorly designed sport to begin with (for example, mandating full contact while requiring subjective policing of the extent and degree of that contact), and the NFL's version of it is an an opaque feedback loop where detail and explanation are continually layered on in attempts to create clarity, but merely drag the game further away from anything resembling logic. How long would it take you to explain the game of football to an alien? A couple of minutes, tops, right? The NFL rulebook is more than 100 pages. 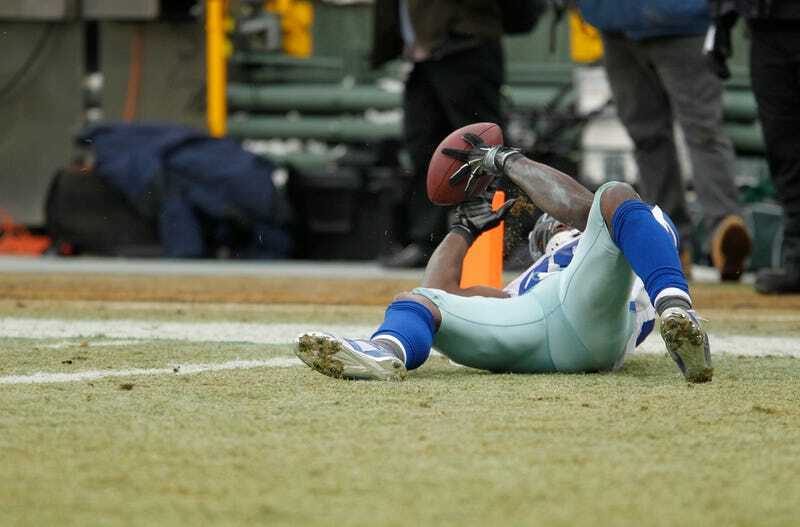 Would any actual human being describe what Dez Bryant did as anything other than a catch? The NFL is not for human beings. I hate this. Hate that we're talking about this, that we have to talk about this. Hate that for the second week in a row, a perfectly exciting and well-played game is completely overshadowed by the vagaries of officiating. Hate that in the NFL's high-flyingest offensive era, no one can define the basic unit of the forward pass. This isn't fun. This isn't why any of us watch this sport, or play this sport. "Although the receiver is possessing the football, he must maintain possession of that football throughout the entire process of the catch. In our judgment, he maintained possession but continued to fall and never had another act common to the game. We deemed that by our judgment to be the full process of the catch, and at the time he lands and the ball hits the ground, it comes loose as it hits the ground, which would make that incomplete; although he re-possesses it, it does contact the ground when he reaches so the repossession is irrelevant because it was ruled an incomplete pass when we had the ball hit the ground." Whatever, man. We know what we saw, and it was a really great NFL game failing to get out of the way of its own rulebook. We look forward to the offseason, when to make sure a controversy like this never happens again, the competition committee adds seven new rules.